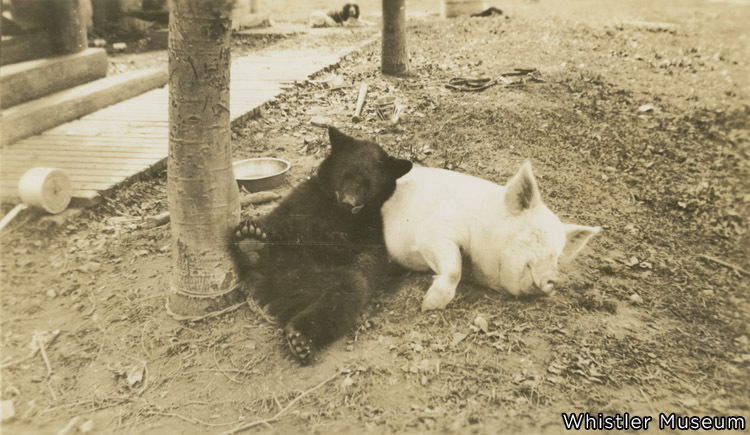 There’s a photograph in the Museum collection of an unlikely pair of friends: a bear cub and a piglet, leaning into each other as they happily lay on their backs. 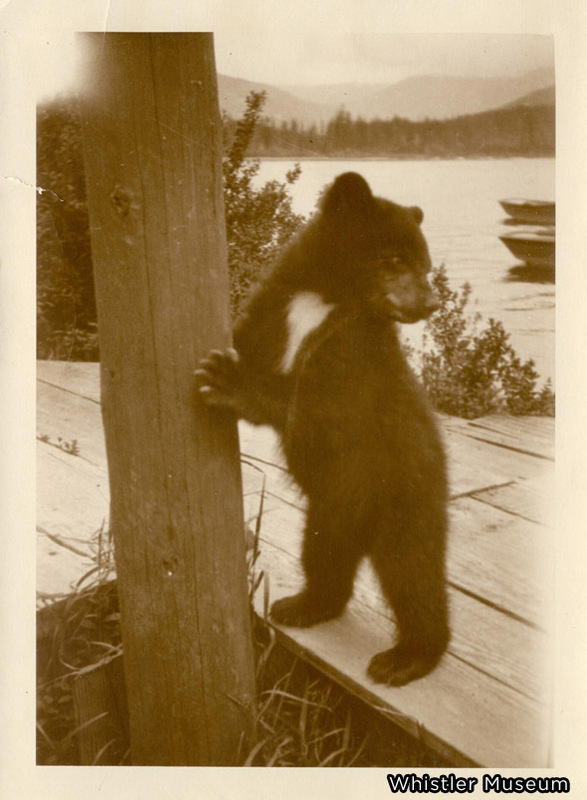 Until very recently, we assumed that the bear cub in the picture was none other than Alta Lake’s most famous bear cub: Teddy. The photograph in question. If you look deep into the background you will see a dog looking on – his name was Freckles and he preferred to keep to himself. The original print belonging to the Museum was very faded, so we weren’t able to see that this bear does not have a distinctive white patch on its chest. This print came from former resident Norm Barr, and the bear’s lack of markings is easy to spot. For those of you who have never heard the story of Teddy, it goes like this: In 1926, Whistler pioneer Myrtle Philip was out picking berries to make a pie with some Rainbow Lodge guests in the woods when they heard a whimpering sound. They soon discovered it was coming from a lone bear cub, whose mother was nowhere to be found. Eventually, they decided to take the bear back to Rainbow Lodge, where he was given the name Teddy and spent the summer happily playing with lodge guests. By the fall, Teddy was getting too big to remain at the lodge, and was taken to the Stanley Park Zoo, where he lived out his days. Myrtle continued to visit him at the zoo over the years, where he would run up to the bars to greet her. Teddy the bear in 1926 – note the white patch of fur on his chest. 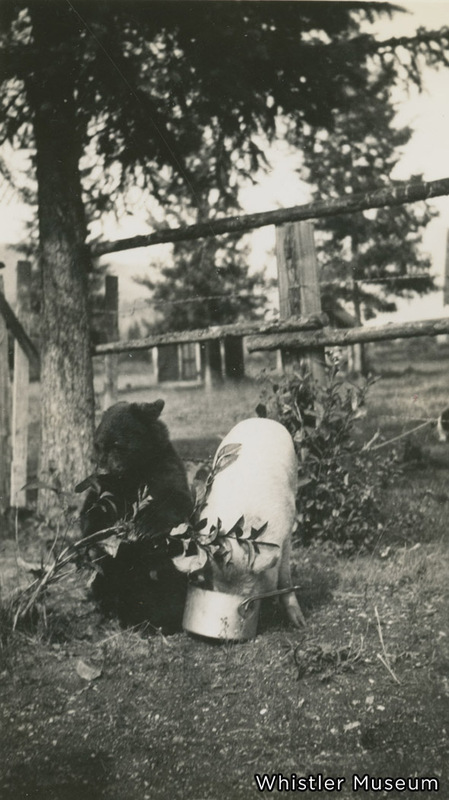 Teddy is the subject of many photos in the Museum collection, so it was easy to surmise that the bear in the photograph with a piglet must be Teddy as well. Recently, Archivist Sarah Drewery interviewed Norm Barr, the son of former Parkhurst owners Ross and Alison Barr, and discovered that there was another bear cub in the Alta Lake area, a decade after Teddy. 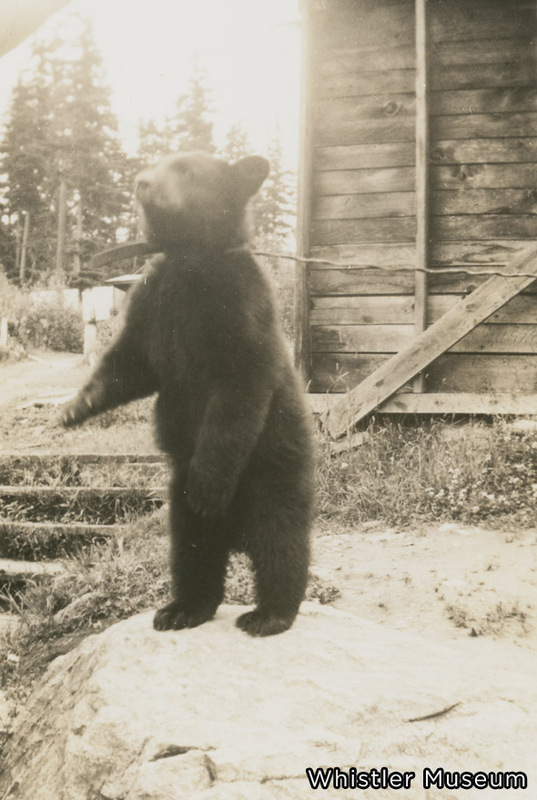 This bear was named Molly, and Molly’s best friend was McGee – a piglet that had been purchased in New Westminster by a teenage Betsy Henderson (née DeBeck). Betsy was interviewed this past month about the two summers she spent at Green Lake with her family, in 1936 and 1937. Her brothers worked in the logging industry, and her mother was eager to get the whole family together, so they rented a cabin at what used to be the Lineham’s mink ranch, prior to the Depression. According to Betsy, the remnants of the mink ranch remained, in the form of cages all over the property. Making their way to Green Lake, the family of six didn’t travel lightly. At a time when travelling meant you had to take the train, the DeBecks managed to bring what might as well have been their own zoo with them: a cow, McGee, Molly, and a spaniel named Freckles. Not to be limited to four animals, they also rented two horses, and had a third horse which her brother Denis apparently found. Not one of them had prior experience riding a horse as they led their rentals away from the barn, but that’s another story altogether. So if McGee came from a farmer’s market in New Westminster, where did Molly come from? Apparently Molly formerly went by the name “Crisco,” after her penchant for breaking into the cookhouse in Bella Coola, where she lived, and eating Crisco to her heart’s content. Betsy’s father Edward was working in Bella Coola, and decided to bring the bear cub to his family, staying at the mink ranch. As you can imagine, her owners were not remotely reluctant to give her away. Although Betsy’s mother initially said she would leave the instant the bear cub arrived, she was easily swayed when Molly got off the train and promptly wrapped her arms around her legs. Molly standing on her hind legs. She looks quite different from Teddy in this photograph. The travel from Bella Coola included taking a ship to Vancouver, and then the train from Vancouver to Alta Lake. While onboard the ship, Molly spent her time in Edward’s sleeper cabin. When Edward ran into a friend who had a rough night on the boat and needed some sleep, he promptly turned over the keys to his cabin, neglecting to mention that Molly was fast asleep on the couch. It seems that the friend initially thought he was hallucinating, but was a bit of a jokester too, so he quickly saw the humor in the situation. After the second summer at Green Lake in 1937, the DeBeck family was moving on to Victoria. While they had a large lot in New Westminster and were able to keep animals, they were moving to a small city lot in Victoria, and had to say goodbye to their motley crew of pets, save for Freckles the spaniel. The DeBecks approached the Alaric family, who had a logging operation on Green Lake, and sold them the cow, Molly and McGee. Molly and McGee enjoy a meal together in 1937. The story of Molly the Bear highlights how easy it is for something to take hold and then continue to be perpetuated until it becomes an inextricable part of the history, taken to be true. One such tale is that Teddy and the piglet (now know to be Molly and McGee) were the best of friends until one day Teddy got a bit hungry and decided to eat the piglet. There is no truth to this, but it was repeated so many times it became easy to believe. Even when we learned that the piglet wasn’t consumed, we no longer questioned whether the bear in the photograph was Teddy. It’s amazing to realize the power of a single image. By collecting oral histories, we are working to build a stronger understanding of Whistler’s history – Molly is just a small (and cute!) example of how effective these interviews are proving to be. Perhaps there are other photographs in the collection like this one, waiting for the story behind them to be unlocked as we speak with early residents of the valley. This entry was posted in From the Archives, Pioneers. Bookmark the permalink.